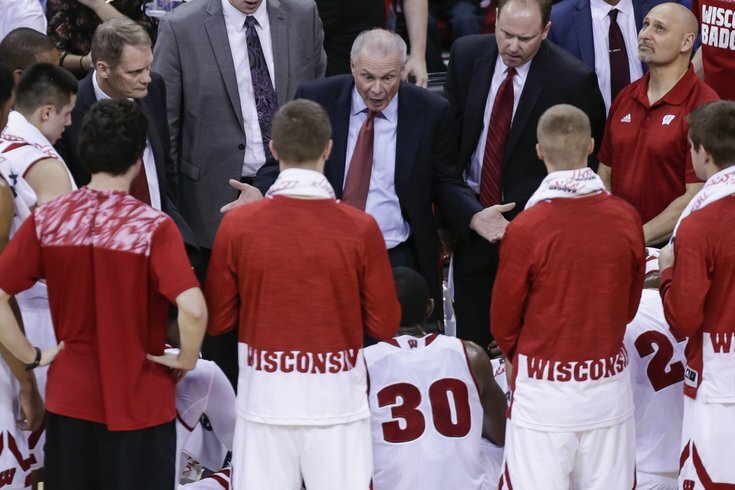 Bo Ryan talks to his Wisconsin team during his last game as the Badgers coach. It's not often that a team makes a deep postseason run with a different head coach than the one with which it started the season. But then again, the circumstances surrounding the Wisconsin Badgers this season were unique, to say the least. Last year, Wisconsin shocked the world when it knocked off undefeated Kentucky in the Final Four before suffering a heartbreaking loss to Duke in the National Championship. And in the offseason, not only did the Badgers lose their two best players in Frank Kaminsky and Sam Dekker -- both were taken in the top 20 picks of the NBA Draft -- but they also found out that head coach Bo Ryan would be retiring following the 2015-16 season. However, here we are in late March and the Badgers are in the Sweet 16, and Ryan, a Chester native, will not be the one leading his team out on the Wells Fargo Center court Friday night. Instead, it will be Greg Gard. You've probably never heard of him, but he's the biggest reason the 68-year-old former coach decided to step away from the game in December, much earlier than he anticipated. Don't get it twisted, though. Ryan didn't quit on his team. If anything, he did quite the opposite. He cared so much about the program he helped build that he that went out of his way to, in his mind, set the program up for the best chance to succeed in his absence. And not just in the short-term, although his move is already paying dividends for his team -- and the coach that took his place. "It's been surreal," Gard said Thursday. "Everything has happened so fast and there have been so many events that – it's been the worst year of my life and it's been the best year of my life rolled into one. So hopefully, we've got a couple of more weeks left in us here, and weekends. Then at that point in time, maybe in May, I'll be able to sit back and really reflect on it. But fortunately, these guys have kept me busy so I don't have to worry about looking in the rearview mirror right yet." By all accounts, Wisconsin athletic director Barry Alvarez wasn't convinced that Gard, despite his 23-plus seasons as an assistant under Ryan, was the right man for the job. But Ryan, who had been coaching in the University of Wisconsin system since 1976, had hand-picked Gard to be his successor. Alvarez, it seemed, wanted a bigger name, someone with some head coaching experience. Ryan believed that by stepping away in December, Alvarez would be forced to at least give Gard the "interim coach" title for the rest of the season. From there, it was up to the 44-year-old assistant to win the job -- and win over his AD. "They actually gave me a five-year contract about three weeks ago," said Gard. "I always had a one-year contract. I thought, wow, I saw five years on that thing, where do I sign? Interim tag -- the best loss we had all year was the loss of the interim tag. That's our best loss in the last three weeks." But it wasn't easy. And in the early stages, it certainly didn't look like Ryan's plan for his former pupil was going to pan out. With Wisconsin already a disappointing 7-5 when Ryan announced his retirement on Dec. 15th, Gard took over a team that was struggling to find its identity. And in their first six games without Ryan at the helm, the Badgers went 2-4 overall and started the Big 10 regular season schedule at 1-4. Things began to turn around when the team knocked off then-fourth-ranked Michigan State, sparking a run for Wisconsin in which it would go 11-2 (4-2 vs. Top 25 teams) to finish the regular season. "Once we had the win against Michigan State, I really think that gave us confidence to – it gave us – it reaffirmed what we were doing," Gard said. "I always believed in it. I knew it because I had lived it through the years with different teams and watched teams go through growing pains. We didn't have anybody in our locker room that had gone through ups and downs." Helping turn the Badgers' season around wasn't the only role Michigan State played in Gard's early success. Like Gard, Spartans head coach Tom Izzo knows what it's like to take over for a legend, and he's he's offered some advice on how to deal with that. "Bo is a part of this program. Obviously he's been a huge part of not only the University of Wisconsin's basketball program but the fabric of basketball within the state of Wisconsin." "The coaches that I've talked to over the years that always kind of forewarned, like, hey, it's hard to take over for a legend, it's hard to step from an assistant into a head coach's role," Gard said. "And one that's advised me a lot has been Tom Izzo, what he went through taking over for [Jud] Heathcote. So for me, really, having nothing to compare it to, it's been very easy [transitioning to head coach], and it's in large part because of what our kids have done, what our players have done. They've been phenomenal from day one." According to the players, however, that was never a problem. "And in order for us to do something, do what we all expect we can do and start to actually win some games we had to change our mindset in the way we approached it. And once guys embodied that, our play picked up as a team and collectively we came together, guys started playing better and we just tried to ride that confidence and that wave from here on out." Making it somewhat easier for the players was their familiarity with Gard -- and the fact that he made sure to put the focus on his players and not his own job security. "He had been there for so long, he had been coaching with Coach Ryan for so many years that it wasn't really much of a change because they had the same, generated the same philosophies on everything," said Bronson Koenig, a junior guard and the hero from Wisconsin's second-round win over Xavier. "So and he told us right from the start that it wasn't about him, that it was about the players, and he was going to do his best to make sure that we are in the best position possible for success and that's what he did. And he told us it wasn't an audition for him. So he just made it all about his players." "Yeah, it's always been about the players," redshirt freshman Ethan Happ added. "And we had a meeting with the coaches the day after [Gard] was announced the head coach. And he talked about how he was just so happy for us that we were getting a chance to contribute and play in the NCAA Tournament. And he's done a great job of making it about the team." Ryan may no longer the coach, but his impact on Gard, his team and the program as a whole is obvious. "Bo is a part of this program," Gard said. "Obviously, he's been a huge part of not only the University of Wisconsin's basketball program but the fabric of basketball within the state of Wisconsin. Obviously, the time that he spent there and helping the game grow and develop from his time at Wisconsin prior from '76 to '84 as an assistant, and then to Platteville and then to Milwaukee and then back to Madison. So he has a huge piece -- he's on The Mount Rushmore of basketball in the state of Wisconsin. "So that will always -- obviously I'm indebted for him. He saw a young college kid 25 years ago or 23 years ago and said, hey, do you want to get into this profession? And I did at the time and he gave me a great opportunity, and obviously I'm very fortunate and appreciative of that." But what Bo knows almost as well as Wisconsin and basketball is the city in which his former team will vie for a trip to the Final Four. So perhaps it's only appropriate that Gard's season passes through South Philly, just a few miles from where Ryan grew up in Chester. "I haven't talked to our guys about that. And they obviously know. They've heard all the Chester stories. I promised I wouldn't recite any of them this weekend for them. I'd tell them anything they want to know about Cobb but nothing about Chester. You know, it is -- it's ironic, coincidental that we happen to be in Chester, his hometown." And had it not been for Koenig's buzzer-beater against Xavier, Wisconsin wouldn't have made it even this far. Given the way this season has unfolded for the Badgers -- and all the extenuating circumstances surrounding his team -- perhaps Gard is simply confusing coincidence with fate.